Why Christianity is still regarded as “western” religion though the center of Christianity has moved into the majority world that includes Asia? It is because westernized Christian theology has not yet answered some of the Asian questions about God in deeper level. It is also because modern Christian mind assumed that ministries based on prosperous economic and scientific usefulness from Christianized modern society would help answer the life questions for the majority world. However, the main theological question seeking the truth of God has not been answered, because only local theologians who know the question deep enough can answer those questions. Though some of the pastors and missionaries are emphasizing self-theology as part of fourth self, after self-propaganda, self-supporting, and self-governing, it has not significantly developed among evangelical churches in Asia. It subsequently hinders Asian Christianity from rooting down deeply as Asian religion into communities in Asia. This article is looking for an answering scheme to the question above by finding a way to make self-theology in Asia biblically missional through globalizing self-theology from integrating evangelism and mission. In other words, it is disciple making that really gives birth to theology. Because “all true theology is, by definition, missionary theology.” Asian self-theology also should follow the missional intention which is innate in global aspect of Christianity. Therefore, the next step for each believer’s community should be to produce self-theology particularly in the context where only a local leader can fully grasp the situation. It is the soil of self-theology that should overcome the guild of theological scholars producing theology in narrow terms. DEVELOPING SELF-THEOLOGY: IS IT TRULY SELF? Self-theology came out of Hiebert’s exhort to mission community to add a “fourth self” to those new growing indigenous churches. It was “fourth self,” more than 120 years after Anderson and Venn proposed three-self church principles around 1861. This “fourth self” would encourage a new church not just take the lead in evangelization, support, and governance but also in creating and managing the people’s knowledge of God. However, it does not mean self-centered theology nor contextualized periphery theology, sided by western theology. It means enlarging the horizon of biblical truth designed by God with diversity in unity. The research direction is to look for knowledge management in church & mission to make disciples and find a way to build hermeneutical knowledge community that produces self-theologies. One of the most concerning risk of self-theology to missionaries were that it might encourage pluralistic theologies. Western missionaries and even westernized Asian missionaries worried that those self-theologies may drift away from fully developed systematic theology and give birth to different kinds of truth. They tend to side contextualized theology not fit into “theology” developed by western theologians. On the other hand, some of them actually want to understand contextualized self-theologies, but there are only a few who can fall in that category. How did non-traditional self-theologians respond to this kind of overconfident theological minds who developed and consolidated Christian theology since the five hundred year old Reformation? Samuel Escobar remarked that all theology is contextual. Though it is true in contextual nature of theology, there is still divine nature and its relation to human nature. Every theology is contextual in which God reveals Himself to human. Kim saw this role of interpreting the message, knitted by divine and human author with accuracy and persuasion as herald. In fact, divinely revealed truth in human context can be found in four different types of the gospel written by Matthew, Mark, Luke, and John. As those four different authors wrote four gospels by spiritual inspiration, the depth of the gospel has communicated widely for spreading the gospel to the all different contexts. Nevertheless, there is still a suspicious view on contextualized theology or even contextual nature of theology. It was not because of a problem from the bible, but because of the problem from western society. Christian minds took fear from the mindset influenced by Darwinism, while fighting against Darwinism and Social Darwinism. Due to the influence from Darwinism, even western Christian leaders and theologians misapprehend that theology developed in different context may end up evolving into a different kind of truth. If a believer were truly born again, this person cannot become other species by trying to answer his or her own theological questions relevant to a new context. This kind of western context specific fear hinders the development of self-theology. This fear, however, would not block Christian zeal for world mission. Even if there is lacking in self-theology, new individual Christians still have relatively sound view on self and others. By interacting with Christians and missionaries who came from communities where theology of God is relevant to their own people, those individuals can be changed. Nevertheless, there would not be sound theology of God without self-theology, because there have been already proper theology according to their traditional religion. It is difficult to change the core of worldview that “shapes the cultural surface”, proper theology and its subsequent repercussion. If a new believer lived in a highly developed religious society in high context culture, it would not be easy for them to really understand the truth and to have a sound relationship with God. Their individual joy from the gospel would not last long due to societal theology of other god. In other words, a new believer may enjoy new relationship with God in faith, yet the previous theology of other god still affect this new relationship. To overcome the previous knowledge on other god, the new believer should have his own self-theology. Another aspect to consider about self-theology is worldview. The purpose of theology is to study God. However, if you have no relationship with God, it would not be a real study of God despite the fact that the person studies about God. That is why theological education may end up giving theoretical and scholastic development to seminarian but not giving proper training for harvest workers. Though new believers tend to have better dynamic personal relationship with God than the existing church members, a way of developing theology is still in western way. In fact self-theology cannot be done without real relationship with God and without proper methodology developed under the ownership of the new believer in their contexts. In other words, self-theology is not truly self, but based on relationship with God and the interaction with other theologians and bible interpreting communities around the world with a commitment to be transformed within the relationship. GLOBAL THEOLOGY, IS IT TRULY GLOBAL? Having faced the shift of the center of Christianity and the emerging contextual theologies, there were attempts to form a global theology derived from western minds. It was big encouragement to see the new development for global theology, but it was not truly global. It was a western version of international theology. If it were truly global, this kind of attempt would include 360-degrees of participation from the world. The minds of western theologians are dominating the introduction and conclusion of the discussion through which they try to suggest methodologies. The majority of theologians add few exotic tastes to those mainstream discussions with some contextualized case studies not as mainstream theology. However, it is not just a problem for theology and Christian society but for society in general including the publications. It is just sad to see that Christians follow this world pattern. Having reflected this reality, there is a challenge to bringing all those different perspectives into theological academia, heavily influenced by western minds. Some of the brilliant minds from the majority world can contribute to this attempt yet it is not for every leader. Even those brilliant minds usually cannot publish until their thoughts are westernized. Then, it could not truly reflect their self-theological perspectives. It may look good in western theological point of view, but it would not help the majority world and also the western world that God constantly brings it together for genuine theology in the Kingdom of God. God is the one who “allotted periods and the boundaries” of ethnic group’s (Acts 17:26) and why does he mix all those people by globalization? He is constantly challenging people’s entire mind to repent and return to the kingdom mind, which cannot be reflected by any single mind. Therefore, this discussion of global & self-theology should go back to the basics, especially the purpose of theology. According to Ashford & Whitfield, the purpose of theology is “to know and love God and to be transformed by His Word so that we can take our part in the ongoing drama of redemption” Their point has been drawn from Calvin who interpreted Exodus 34:6-7 as doctrine of God and purpose of theology. That God did not reveal Himself to answer Moses’ question but in a way to relate to humans with deeper relationship that manifested God’s characters in action. Having followed the theology that God lived out to Moses, those editors should make themselves humble enough to recognize different ways of doing theology, to become what it is, attempt global. The group of editors should include theologians from different backgrounds to form a multicultural interpreting community in Christ. It will take longer time to form the editing team and to spend enough time for mutual understanding. After that, they need to have a constructive process of counter contextualization in knowledge and action in theology making. It is mutual and sometimes even reverse learning from one another in theology that involves not just the cognitive area of theology but also including praxis in the body of Christ as learning organization. In other words, believing communities whether they are from evangelist-missionary sending churches or evangelist-missionary receiving churches, those communities need to apply the biblical truth by ongoing adaptation towards one another and learning from one another. In this kind of bible reading, the theological community can be regarded as learning believers’ community. As a part of learning community, as well as bible reading community, theologians also need to learn from one another in various ways. A question for the logical extension from learning one another among the community of theologian, is how the community is going to learning from one another and manage the knowledge for future generations. According to Scharmer, learning organizations have three forms of knowledge in theology. Those are explicit knowledge, tacit embodied knowledge, and self-transcending knowledge. 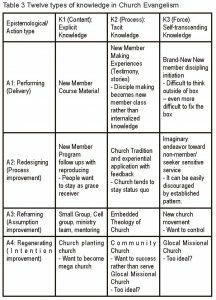 Now we are going to apply this knowledge frame of three different organizational learning into Evangelism and Mission in the process of disciple making as common ground. In this three forms of knowledge, explicit knowledge is “the least difficult to disseminate and distribute”, because it is obviously clear to everyone. The other two kinds of knowledge: tacit embodied knowledge and self-transcending knowledge, are actually the same kind as tacit knowledge. Basically self-transcending knowledge is not yet embodied tacit knowledge. In other words, explicit knowledge can be regarded as content. Embodied tacit knowledge is viewed as part of the process that interplays between explicit knowledge and tacit knowledge in spiraling movement. Self-transcending knowledge is about inspirational force that brings knowledge “from absence to presence”. 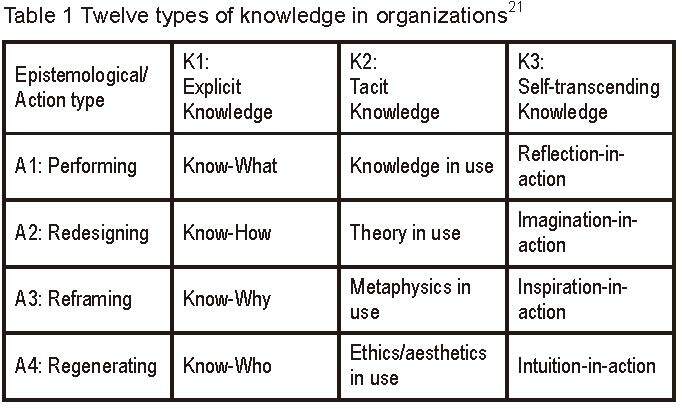 Scharmer organized these three different forms of knowledge into “twelve types of knowledge in organization” by classifying those three forms of knowledge with four different levels of corporate action. Those four levels are: A1) Performing which delivers results; A2) Redesigning which improves the process-based context of performing; A3) Reframing which improves the assumption-based context of performing; A4) Regenerating which improves the intention-based context of performing. 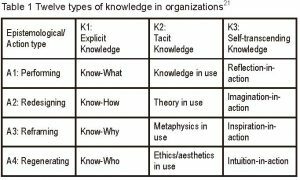 See the table 1 for the twelve types of knowledge. Scharmer especially introduced the concept of self-transcending knowledge which is not-yet-embedded knowledge. 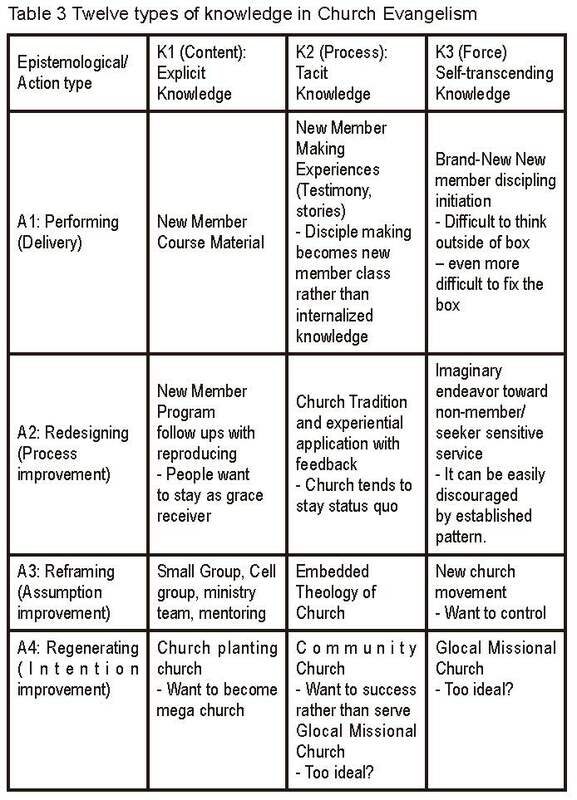 This not-yet-embedded knowledge is an important one to successfully compete for “increasing return markets” and “leaders need a new type of knowledge that allows them to sense, tune into and actualize emerging business opportunities.” Applying to ministry setting, servants of the Lord should follow Christ in ministry as he obeys God the Father. Now the servants of the Lord should follow spiritual protocol “to find self” in Christ and to do ministry well in this rapidly changing world (John 14:24). 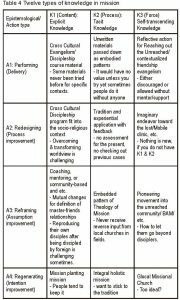 Through this framework of twelve types of knowledge, this article is now looking for the biblical model for disciple-making ministry, a local church, and a mission organization. Actually the concept of self-transcending knowledge shows us the knowledge that a new church/mission desperately need, self-theology that leads each church/mission to find out God given emerging opportunities for the Kingdom of God. 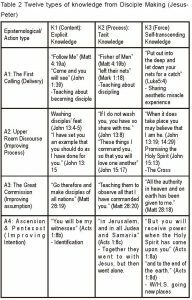 It is most important to look at how Jesus made disciple in various levels of knowledge and forms in these twelve types. Presumably this research cannot find out all of His knowledge but it is a humble effort. 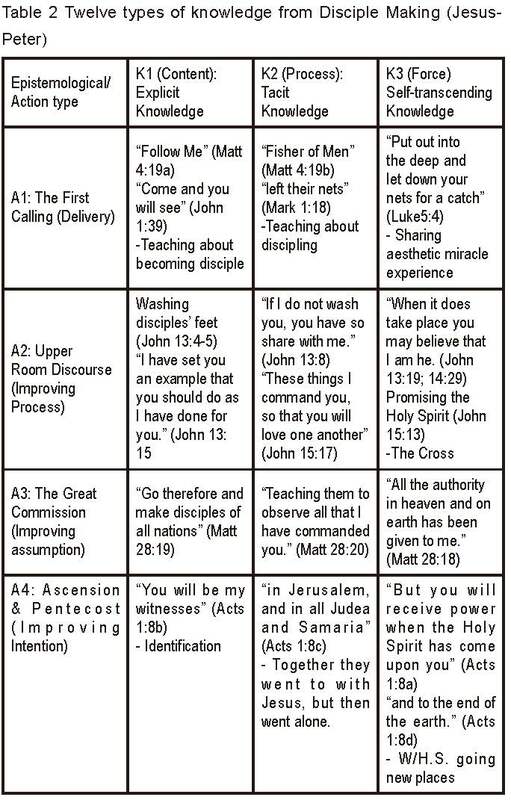 The table below is focused on Peter whom Jesus called, commissioned, tested, and re-commissioned. One fact that should be noticed here is that every disciple should be discipled first to disciple others. The explicit knowledge that Jesus communicated to his disciples were clear yet due to disciples’ different assumption and intention, it took for a while for them to understand Jesus’ teaching after the cross and His resurrection. Jesus used the disciples’ tacit-embedded knowledge that they learned from their synagogue study and Jewish religious life. It showed how much Christ fulfill the law through regeneration (Matt. 5:17). After the Pentecost, the disciples went on with their witnessing journey with the Holy Spirit for discipling others. When you organize knowledge built around a local church setting, the researches see ideal knowledge and its realistic situation like this in the table. It should not be forgotten that disciple making is the proof of living faith. 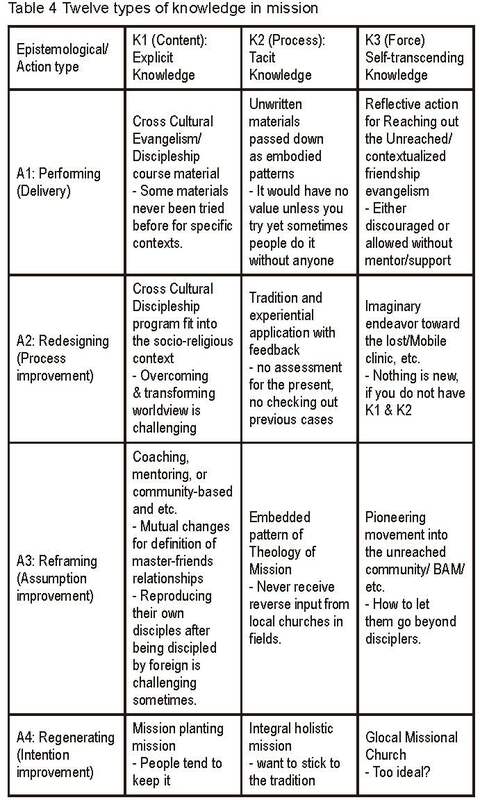 If a church is growing in faith and in life, discipleship as the Christian life and church membership go overlap. However, when there is no training/practice on reproducing disciples in a believing community, it becomes legalistic quickly. When a church is only regarded as religious organization without new blood. It quickly become a dry boned rigid organization not sensitive to the community context where the church is called. It is not because they do not want to do that, but because they cannot reach out to new non-believers. How can the church/mission rekindle the spirit of disciple making within or outside of the church? As a mission organization grows, it tends to take tools to accomplish each organization’s purpose. When the mission is drift according to its natural course, those tools become main thing and lose its original purpose. 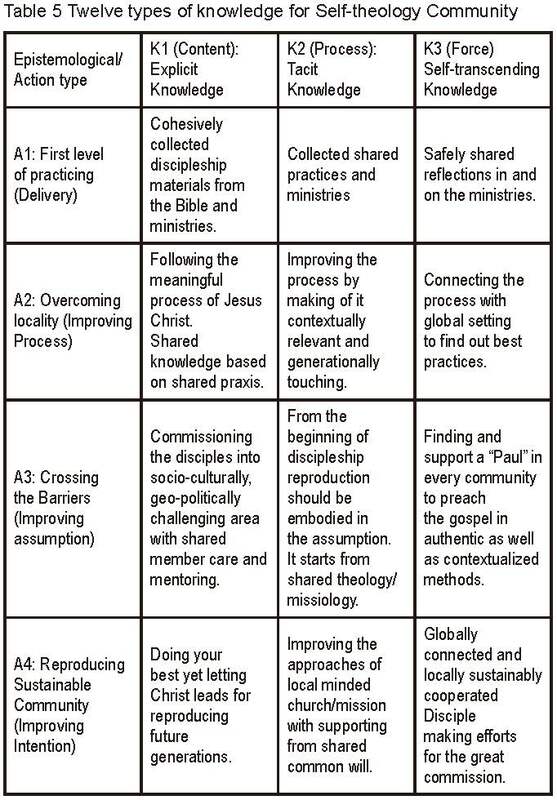 Table 4 below shows the knowledge that a mission organization should keep is the knowledge of making disciples. 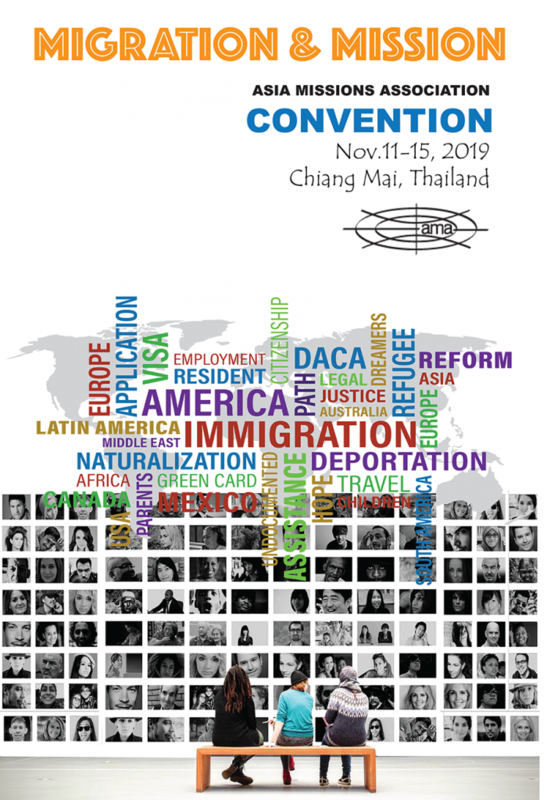 The world is globalized and its subsequent impact on local communities is deepening in ways evangelism and mission is required to connect, cooperate and integrate. For accomplishing the Great Commission, evangelism and mission should be integrated. In other words, local churches and mission organizations need to integrate ministries at home and overseas to overcome innate challenges and shortcomings in this global era. What does the word integration mean? It is the question we need to address here first. There are several meanings of integration in Christian faith. It could mean integration between life and faith, between Sunday and weekdays, between the priest and the laity, and between evangelism and mission. Here we are focusing on integration between evangelism and mission that moves the Christian ministries in another level, because now no one can accomplish the Great Commission alone and everyone is already involved in it by globalization. Actually it is difficult to tackle the issue of integration though it is lofty ideal based on biblical truth. Disciple making is one of the loftiest things to do and the practical tasks for church and mission to start. However, according to those three tables above tables 2, 3, 4, there are ideals and realities that do not match with each other due to silo minded ministries and myopic concepts within church and mission. If then, we can still ask what is the locus of integration in disciple making church/mission in global setting. 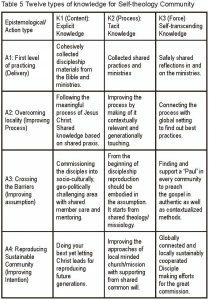 That is self-transcending witnessing ministry knowledge creation that is used for answering to theological/missiological inquiries derived during disciple making ministry. In other words, self-theology with discipleship making could be the locus for integrating evangelism and mission. Here I would like to suggest the community of self-transcending knowledge for answering ministry questions derived from Asian contexts through which developing biblical global Asian self-theology is secured not just in theory but also in reality for shaping Christianity in Asia Biblically Global. See the community’s knowledge of creation and management patterns below at table 5. Please note that even if there is a need for self-transcending knowledge, it is still necessary for ministers to acquire other forms of explicit and tacit knowledge and its subsequent creation and management skills for developing self-theology/missiology. For each party’s role and its subsequent strength in the integration is that a local church can truly make a self-theology when they become missional through disciples – making. For a mission organization, it can truly contribute to the church by letting a local church take the lead in answering to the theological question while those organizations are sharing the gospel. This kind of facilitation and taking lead cannot be done alone. The communities of self-theology for creating and managing knowledge for witnessing ministry could be an answer to cooperation and collaboration among kingdom minded churches/missions for God’s Kingdom. It could be a platform to integrate evangelism and missions. Every body of Christ should be connected and built around the foundation of Christ the Lord. Those churches and organizations are no longer strangers. Brothers and sisters from all over the world in Christ are no longer outsiders but citizens of the Kingdom of God (Ephesians 2:19-20). *This paper was presented at the AMA Triennial Convention, Manila, 2016. Rev. Park is an ordained minister and has served in five different countries in three continents as youth pastor, mission pastor, mission origanization staff, missionary, and leader. Currently he is serving as the Regional Director for SIM CSEA (Continental & South East Asia). He has earned his Th.M. from Southern Baptist Theological Seminary (Louisville, KY) and he also holds M-Div. and MA (Muslim Studies) from Columbia International University (Columbia, SC) in US. He is a strategic thinker and practitioner for facilitating leaders in the CSEA region to initiate, grow, graduate, and support team ministries. Kirk, J. Andrew. The Mission of Theology and Theology as Mission. Harrisburg, PA: Trinity Press International. 1996, 50. Hiebert, Paul G. Anthropological Insights for Missionaries. Grand Rapids: MI, Baker Academic. 1985, 196. It is still prevalent thinking especially against contextual theology, though R. C. Sproul admitted that “no one has ever done it [systematic theological work] perfectly” in his book Everyone’s A Theologian: An Introduction to Systematic Theology. Sanford, FL: Reformation Trust Publishing. 2014, 7. Greenman, Jeffrey P. & Green, Gene L. Global Theology in Evangelical Perspective: Exploring the Contextual Nature of Theology and Mission. Downers Grove: IL. IVP Academic. 2012, 11. Kim, Julius J. Preaching the Whole Counsel of God: Design and Deliver Gospel-Centered Sermons. Zondervan. 2015, 20. Richards, E. Randolph & O’Brien, Brandon J. Misreading Scripture with Western Eyes: Removing Cultural Blinders to Better Understand the Bible. IVP Press. 2012, 17. Darwin, Charles. On the origin of species by means of natural selection, or the preservation of favoured races in the struggle for life. London: Murray.1859. Coning, Danielle. “Reconciling self, other and God: the gospel responding to fear, guilt, and shame in Thailand”, in De Neul, Paul. Reconciling self, other and God: the gospel responding to fear, guilt and shame. SEANET XVII, 2017. Hiebert, Paul G. Transforming Worldviews: An anthropological understanding of how people change. Grand Rapids, MI: Baker Academic. 2008, 32. See some of well-intentioned western initiated books, not without limitations, such as Globalizing Theology (ed. Ott & Netland) and Global Theology in Evangelical Perspectives (ed. Greenman & Green). Jen Calleja interviewed Deborah Smith who translated two books from Han Kang, a Korean novelist. Smith described the reality of publishing industry in UK that it is so difficult to get published if a book is written in non-European language due to implicit biases, lacking funds, and inherent conservatism. Ashford, Bruce R. & Whitfield, Keith. “Chapter 1. Theological Method: An Introduction to the Task of Theology” in Akin, Daniel L. (ed.) A Theology for the Church, Revised Edition. B&H Publishing Group. 2014, 6-7. Calvin, John. Institutes on the Christian Religion, trans. Ford Lewis Battles; ed. John T. McNeill. Louisville: Westminster John Knox. 2006, 1.10.2. Park, S. David. Counter Contextualization, Unpublished paper, 2008. Carroll, John M. (ed). Learning in communities. University Park: PA. Springer. 2009, v.
 Scharmer, Claus O. “Self-transcending knowledge: Organizing around emerging realities” in Nonaka, Ikujiro & Teece, David J. (Eds.) Managing Industrial Knowledge: Creating, Transfer and Utilization. Sage Publications, 2001, 68-90, 70. Scharmer, Claus O. “Self-transcending knowledge: sensing and organizing around emerging opportunities” in Journal of Knowledge Management. MCB University Press. Vol. 5, No 2, 2001, 137-150, 140. Scharmer did provide the philosophical background for these three forms of knowledge in this article pp. 142-144. Leeman, Jonathan. Church Membership: How the world knows who represents Jesus. Wheaton, IL: Crossway. 2012, 130. Greer, Peter & Horst, Chris. Mission Drift: the unspoken crisis facing leaders, charities, and churches. Minneapolis, MN: Bethany House Publishing. 2014, 20.